In a baking dish, mix the pork, cider, taco seasoning, half of the vinegar, and a pinch of salt. Mix well and put into the oven at 325°F for about 2 1/5 hours, stirring once in the middle of cooking. Shred the meat and mix with the liquid. Chop the onion, jalapenos and garlic, discarding the seeds if you don't like it spicy. Chop up the squash to get 4 cups of cubed squash. Cook the onion and jalapeno with a pinch of salt for about 12 minutes until lightly browned. Add the garlic and cook 1 minute. Next add the squash and a bit more salt and cook another 10 minutes or so, just to lightly brown a little bit of the squash, but being sure not to overcook the onions. Stir the milk, honey, paprika, and rest of the vinegar into the squash. It will probably separate and look curdled, but that's ok. Simmer on low for about 45 minutes until the squash is tender. Puree the squash in a blender or with a hand blender until very smooth. Taste and adjust seasonings as necessary. Shred the sprouts either with a knife or a food processor. Get a pan crazy hot with plenty of vegetable oil. Add in your sprouts and let them sit for 2 minutes, then stir and sit for another 2 minutes. Repeat until you get some nice browning on the sprouts, about 8 minutes total. Finally build your tacos! Heat up the shells, add in some pork, then the squash sauce, followed by cheese, then the charred sprouts. I originally had these tacos at a well known fancy Mexican restaurant. I ordered them because I love brussels sprouts and pork, and I initially didn’t notice the squash on the menu. When the plate arrived, it was delicious, but I hadn’t expected such a fall focused dish. Especially because it was April! I made a mental note to myself that when the leaves and the weather began turning, I would make my own version of these tasty Shredded Pork and Squash Tacos. They came out great! Get some pork into a pan with hard cider and taco seasoning. Pop this into the oven and let it do it’s thing for about 2 1/2 hours. Meanwhile, cook down some onions and jalapeños. Add the squash and let it brown for a few minutes before adding the liquid. Some milk, paprika, honey, and vinegar. It will separate, but don’t worry. After the squash is tender, zip it up with the blender. Shred up the sprouts. You can use a food processor for this. Then dump them into screaming hot oil to get some nice charred spots. Everything ready for the tacos. 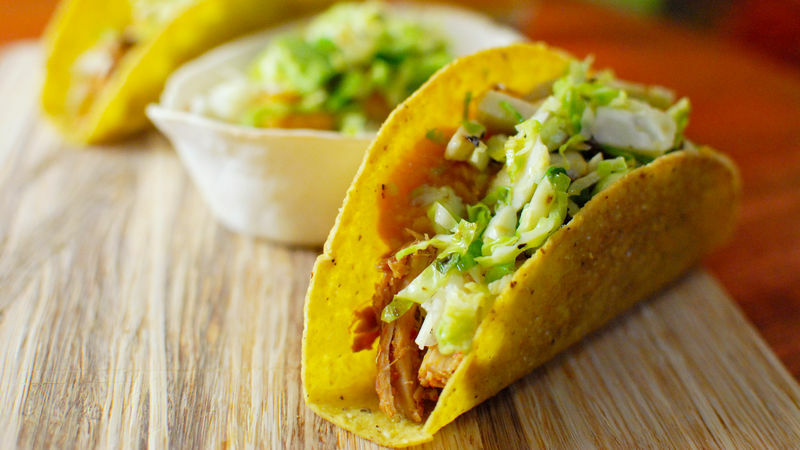 These tacos have the exact flavors that you are craving right now. Make them for your family tonight and you won’t regret it! Dan Whalen gets confused when he eats squash in the spring. He has been blogging for over 5 years at The Food In My Beard. Check Dan's Tablespoon profile often to try his recipes with creative international spins!